This is the second post of my 5 Tenets of Taekwondo series. The first post focused on Courtesy. Today, I would like to discuss Integrity. You sometimes hear Integrity and Character used interchangeably, but I once heard this definition that continues to resonate with me. Character is doing what is right. Integrity is doing what is right when nobody is looking. When I had to select a tenet to write about during my progression to black belt, I chose Integrity. Because it counts on doing the right thing when there are no witnesses, it is one of the easiest virtues to “gray the lines”. For example, I once had a situation where I had an insurance claim right before my coverage switched to a different carrier. I then had an almost identical “event” happen within a few days of the first one…after I had switched carriers. Someone mentioned I should just roll all of the costs under the original claim. It would not add much to the original claim, and nobody would know the difference or even care. However, I could not do it because it was simply dishonest. I ended up paying a double deductible. I guess my grandmother raised me right :). Social Media presents the interesting paradox of being highly visible and global…from the comfort of your own office or mobile device. We can say or claim anything, and people will assume it is true because it’s on the Internet, right? Do we over-market our products and services’ capabilities or stability? Do we ever participate in the Sin of Omission and reassure ourselves with the platitude “well, the customer didn’t ask about that”? Do we pirate software or perform illegal downloads of music and videos? Do we seek to tear down a competing brand versus simply focusing on the benefits and “good name” of our own brand? I’m not talking about an objective comparative analysis here…I’m talking about attacking a competing brand with unfounded criticism. There are even worse cases of actual brand assassination for which professionals now exist solely for brand protection. If it is true that a company can lose up to 30 customers for each negative review, a strategic “negative review campaign” could wreak havoc with your competition. I have a great quote for that one: What Goes Around Comes Around! If you do get caught not acting with integrity, the repercussions can be both immediate and immense. Thomas Paine captured it well when he stated “Character is much easier kept than recovered”. So how well do we follow our moral compass in social media? 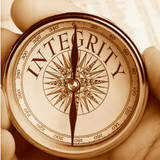 Do we always take the Path of Integrity? Who holds us accountable? What do you think is the best/worst examples of Integrity we have witnessed in 2011? There are so many examples to draw from in 2011 (in just 6 months of 2011). Living in Columbus, Ohio I of course have to look to the whole debacle of the OSU Football coach and five players (or more). So sad to trash yours and others reputations over such frivolous actions. Agreed, Cheri. None of us will have squeaky clean shoes, but we can still strive to live w/integrity. What did our grandmothers always tell us: “If you don’t have something nice to say, don’t say anything at all”. It is one thing to be an informed consumer, and to pass along that information to others. It is another to become malicious or operate in the gray areas of truth.